Finally there’s a business communications system that works as hard and as fast as you do. Mitel’s innovative business phones, collaboration tools, application integrations, mobility and contact center applications empower organizations and people to work smarter and stay connected, no matter the time, place or device. Mitel business communications solutions are highly scalable, reliable and secure. Best of all, they eliminate the expensive complexity that’s found in other phone system solutions. Can your business communications system do this? Mitel Connect offers a powerful, easy way to stay connected everywhere, always. More than just phone service, Connect includes a streamlined app that includes IM, conferencing, online meetings and video on your desktop and mobile devices. Deployment Options: Cloud, On-Site or Hybrid? Mitel Connect Cloud: A hosted, managed VoIP phone service with an experience users love. A hosted, managed VoIP phone service with an experience users love. 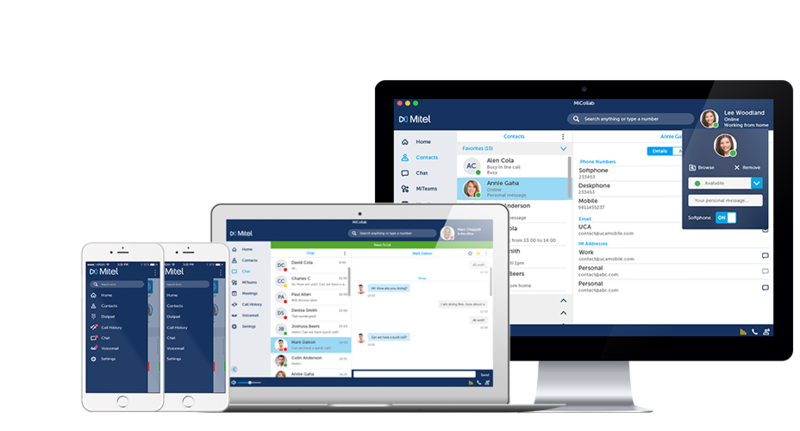 Mitel Connect CLOUD is a premium VoIP business phone service that every department in your company will love. Discover the Mitel Connect CLOUD difference: an exceptional user experience that presents the robust system features in an entirely user-friendly way. It’s an end-to-end service from phones to software to premium customer service, and it’s so easy to provision that it’s practically plug-and-play. Built-in operational redundancies assure high availability and business communications continuity; Secure Real-time Transfer Protocol ensures your service is always highly secure. Discover the Mitel Connect ONSITE difference: an exceptional user experience that presents robust system features in an entirely user-friendly way. Distributed architecture that assures business communications continuity. An outstanding management interface that saves time and money, and line of business integrations that make time and money. All with the lowest total cost of ownership of any on-premises system. Mitel Connect HYBRID combines the immediacy and convenience of managed service subscriptions delivered via the cloud with the solid performance and control of an on-premises system deployment. The result is a flexible, adaptable and strategic approach to unified communications system deployment. No matter what size your business, you know that customer satisfaction is tied to repeat business and your company’s reputation. Personalizing your service opens the opportunity to upsell and cross sell, and having staff available at the times your customers want to reach you can earn loyalty. The right contact center can make it easy to optimize your resources, improve response times, route calls effectively, and access account data– so customers feel valued and trust your brand. Mitel offers a wide range of telephones for use within its business communication solution, each designed to help boost productivity and meet the needs of every user—from busy executive to remote worker, and from operator to contact center agent. Each phone is preconfigured for quick and easy installation with the Mitel Unified Communications (UC) system and offers all the advanced features, high performance and quality required in today’s constantly connected workplace. Mitel Voice Switches are key building blocks of the Mitel Unified Communications (UC) system and deliver UC to organizations of every size —from large enterprises to small and medium businesses. Highly reliable and intelligent, these switches unify communications across multiple enterprise locations, supporting IP phones, analog devices, and a variety of trunk interfaces. Mitel Voice Switches manage Mitel IP Phones and analog lines, as well as PSTN and ITSP trunks. Mitel delivers breakthrough Unified Communications solutions with a single system spanning multiple locations, which dramatically simplifies employee communication and boosts customer satisfaction. Voice communications are the foundation of any business, demanding the utmost in system availability. Mitel Voice Switches exceed today’s most stringent enterprise IT requirements, delivering 99.999% reliability. With stackable, space-efficient designs, Mitel offers a wide range of solutions for organizations of any size. Growing companies simply need to add Mitel Voice Switches; the system scales geometrically and seamlessly. Mitel’s exceptional ease of installation, ease of use and centralized management significantly lower ongoing maintenance and operating expenditures. New ports and users can be added by simply connecting switches to the network. "DataComm has a proven track record of combining strong security and support with value. Our security assessment auditors continue to make positive documented comments concerning DataComm’s reactions to their security testing."